Narcissus tazetta (Amaryllidaceae family) is a fragrant bulbous Mediterranean flower that starts its blossom before the end of winter. The name of the genus comes from Narcissus and the name of the species "tazetta" means small cup and refers to the yellow crown of the flower. 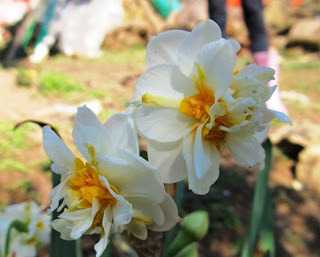 It can be found under many common names: Daffodil, Chinese Sacred Lily, Bunch-flowered Narcissus and Joss flower but also in greek it has various names: βοστίνα, μανουσάκι, μυρτολούλουδο, τσαμπάκι και ζουμπούλι. They can usually be seen in vast numbers in fields and meadows in low altitude where they usually appear in clusters. It is considered to be the oldest cultivated narcissus. In China it is a symbol of good luck whereas in Europe of vanity due to the myth of Narcissus. Love to read about the flowers you show us. I love these sprng flowers....... here we have a lot of them in March and april. Τα μανουσάκια τα άγρια μοσχοβολάνε στην Κρήτη. trully they spread their aroma everywhere!! How beautiful these flower looks in her own natural habitat. The thing I don't like about the modern species is that they don't smell any more. The same with the roses you buy in a flowershop.